While everyone and their mother, aunt, bestie, boss and neighbor is foaming at the mouth over Starbucks Pumpkin Spice Lattes, I'm equally excited about another seasonal beverage! Don't get me wrong, I'm a legit pumpkin fanatic (as proven by the homemade "Jennifer's Pumpkin Harvest" cookbook that my mom made for me a decade ago! *Pictured above). It's just that the pumpkin lattes are so syrupy and full of dye that I always end up with orange-toned cotton mouth. My true "Oh yay, it's Fall!" 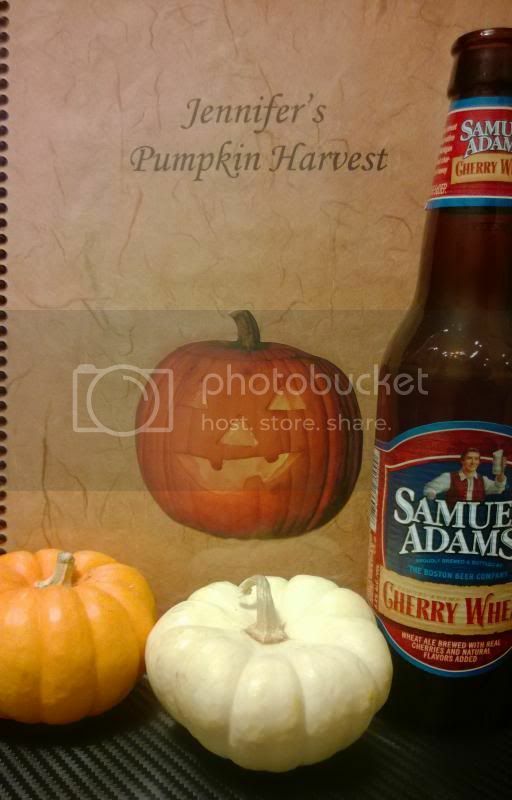 beverage is Samuel Adams Cherry Wheat Ale. It always seems to appear just before the 24 Hour Short Story Contest, which inevitably leads into NaNoWriMo a month and a half later. It's a time of imagination and magic, all compounded by the ever so slight buzz of this brew. I'm not going to lie. I'm sure I'll order a Pumpkin Spice Latte or two. I mean, come on, it's a thing. Cherry Wheat Ale, though ... well, that has a special place in my fridge all season long. I have to admit, I've never tried any of the pumpkin spice items at Starbucks but I get SO excited for the winter items ... I'm such a peppermint girl! and the peppermint frap is my must have winter splurge! I'll have to try the peppermint frap this year! Coffee Bean & Tea had a chocolate orange mocha a few years ago and they never brought it back. I look every year now. It was so amazing!